"Let's get Homestead moving on two wheels again. 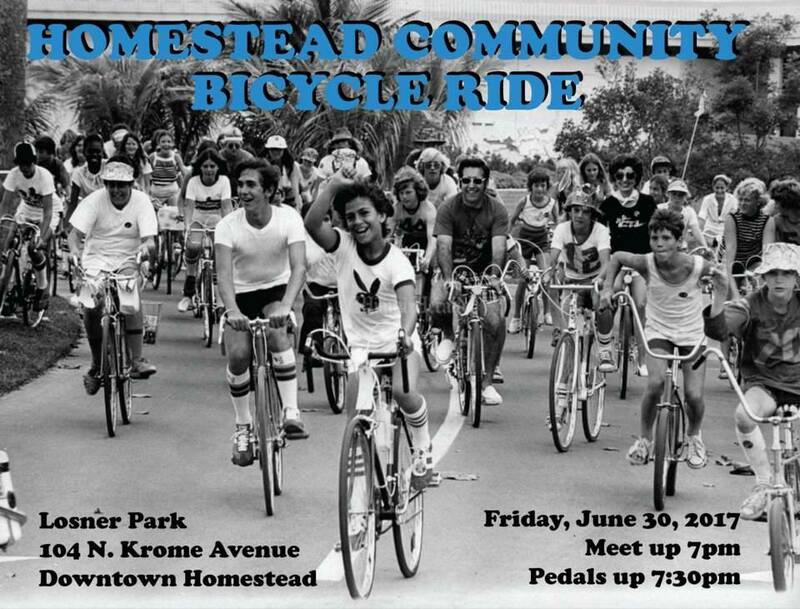 Meet up at the stage in Losner Park in Downtown Homestead at 7pm. Pedals up at 7:30pm. You must have front and rear lights for this ride, since it will get dark during the ride. This is a slow ride showcasing the various areas and neighborhoods through the Homestead/Florida City area. The course will be 10 miles, no route map will be posted as we want all riders to stay behind and follow the ride leaders. We will begin and end at Losner Park. There are several restaraunts around Losner Park, that you will see along the route, for you to get a beverage or food at post ride."